Is Oxycodone Rehab Aftercare Necessary? Treatment does not end when you officially leave detox and rehab – oxycodone addicts must continue to receive aftercare therapies in order to increase the likelihood of remaining abstinent. Studies have shown that oxycodone abusers who abandon aftercare therapies are more likely to relapse than those who continue with aftercare. Examples of aftercare include psychosocial therapy, counseling, group therapy, and medical care. Without adequate aftercare, oxycodone addicts are very likely to relapse. Relapse prevention is generally the overall goal of treatment and aftercare; it is accomplished by teaching oxycodone abusers to deal with their strong cravings in a constructive way. Cognitive behavioral therapy, for example, has been shown effective at redirecting the thought processes associated with cravings and the recovering addict can find a healthy way to cope with strong feelings and/or cravings. As with all types of substance abuse, oxycodone abuse is a chronic, relapsing medical/mental health condition. Relapse to oxycodone use occurs, and should not be considered a failure. Treatment and recovery are dynamic processes, and relapse is just a component of the long-term maintenance of a chronic condition. Studies have compared oxycodone abuse to chronic medical conditions, such as asthma or coronary artery disease. While medication and other treatments may be effective at initiating remission (or abstinence), problems may arise in the future to precipitate a relapse of symptoms or oxycodone use. The only failure would be in not entering treatment at all. Please, call one of our treatment support specialists today at 1-888-993-3112Who Answers? to start on the road to recovery and find the best treatment or aftercare option for you. There are many options available to individuals struggling with oxycodone addiction that can prevent or minimize the risk of relapse, including medications (such as methadone or naltrexone), cognitive behavioral therapy, counseling, sober living arrangements, or group therapy. Many of these same treatment options are available during rehab or detox treatment, but continue to function in the capacity of continued aftercare. One thing that you should keep in mind is that oxycodone abuse often begins with a legitimate prescription and a need for pain control. The underlying condition that required pain control must be addressed in order to minimize the risk of relapse for the sake of pain control. Talk to your doctor about your concerns and see if there is a suitable pain management alternative to oxycodone or other painkiller medication. Cognitive-Behavioral Therapy (CBT) has been shown to be particularly effective for oxycodone abuse. This treatment intervention focuses on shifting the thought process of the user away from oxycodone, so that it is not used as a coping mechanism, and towards more healthy and effective ways of dealing with stress and emotions. Motivational interviewing can be included as a component of CBT, in which the user discovers his own internal motivation to stop using oxycodone. Along with group or family therapy, these counseling interventions can be combined for the most comprehensive effect on the management of oxycodone addiction. Narcotics Anonymous (NA) brings together groups of fellow recovering addicts (oxycodone as well as other narcotics, such as heroin) that meet often to discuss the trials and tribulations of life during recovery. The main philosophy of NA revolves around the 12-steps of recovery. Basically, this program teaches you how to cope with struggles and live your life without oxycodone. While not affiliated with a single organized religion, 12-step programs incorporate spiritual living and concepts such as morality, ethics, honesty, and faith to further your recovery. One of the treatment options for oxycodone abusers includes substitution and/or antagonist therapies, such as methadone, buprenorphine, or naltrexone. These medications require a valid prescription, and agonists such as methadone and buprenorphine usually require daily clinic visits in order to receive the medication (as these medications have a high abuse liability and must be tightly regulated by medical professionals). However, even if you are attending a methadone clinic, all recovering oxycodone abusers should become established with a general practitioner. Again, the majority of oxycodone abuse begins with a pain control prescription, and if you are still having pain after detoxing from oxycodone, you should seek the advice of your doctor. It should be noted that, participation in a substitution therapy is associated with a reduction in criminal convictions comapred to not participating. After detox and rehab, some oxycodone addicts wish to enter a sober living facility, such as a therapeutic community. These communities are characterized by the entire population of the facility living with sobriety, and working together to make the community function smoothly. 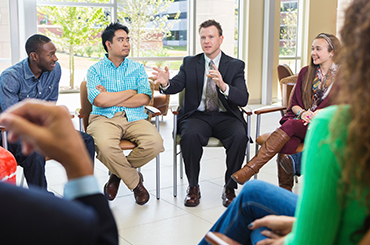 Typically, group therapy is also encouraged daily, as well as possible 12-step meetings. Therapeutic communities (TCs) have documented success for maintaining abstinence in oxycodone addicts, and should be considered if you think something like a TC would be a good fit for you! Another somewhat unique treatment for oxycodone abuse is contingency management (CM), which involves rewarding the patient for clean drug tests with vouchers or cash. CM has been studied in many various drugs of abuse, and has been found to be quite effective for opioids (as well as cocaine). One of the advantages of CM is the evidence that it reduces the rate of relapse among recovering opioid abusers. Oxycodone abuse is not only a personal disease but a family disorder as well. Family and friends of an oxycodone addict can suffer through emotional struggles while the addict is going through their own tribulations. Remember, you as the family member are not as useful to your loved one in such a vulnerable emotional state. One of the most important things you can do for your loved one is to offer unconditional love and support during this difficult time. Please seek help if you feel you need to talk about some of the pain associated with having a loved one with an oxycodone addiction. Call 1-888-993-3112Who Answers?. Carroll, K. M., Onken, L. M. (2005). Behavioral therapies for drug abuse. American Journal of Psychiatry, 162(8), pp. 1452-1460. McHugh, R. K., Hearon, B. A., Otto, M. W. (2010). Cognitive-Behavioral Therapy for Substance Use Disorders. Psychiatr Clin North Am, 33(3), pp. 511-525. Vorma, H., Sokero, P., Aaltonen, M., Turtiainen, S., Hughes, L. A., & Savolainen, J. (2013). Participation in opioid substitution treatment reduces the rate of criminal convictions: Evidence from a community study. Addictive Behaviors, 38(7), pp. 2313-2316.